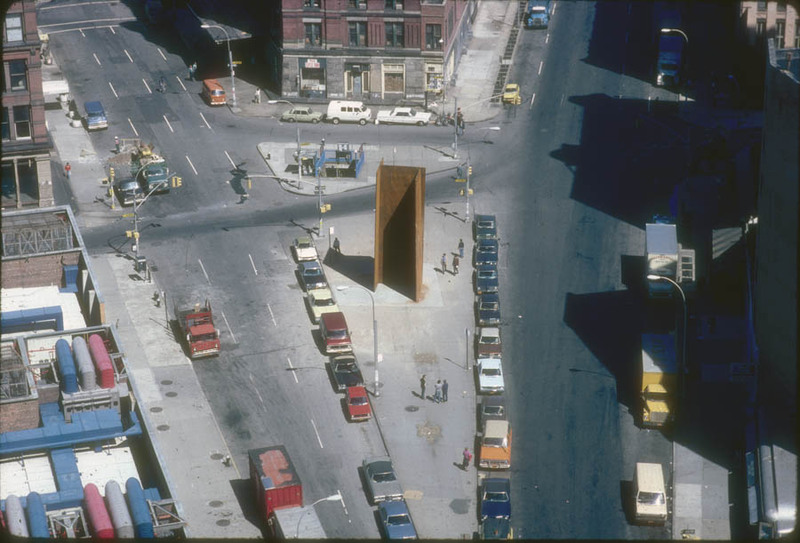 Richard Serra started making large-scale public sculptures in the 70s. Some of these are on the consecrated grounds of museums and sculpture parks, but many, such as TWU above, were placed in decidedly unconsecrated public areas. They weren't always respected there. A piece called Slat (1985) was removed in 1989 by the mayor of Puteaux after it became a magnet for graffiti and vandalism. Tilted Arc (1981) was eventually removed from the Federal Plaza in New York City over Serra's very strong objections. The thing about these sculptures is that their relationships to their environments and to the populations that interact with them is not the same as sculptures in a museum or in a private space. An art-lover might look at a Serra in terms of mass, in terms of the color and texture of Cor-Ten steel, in terms of its relationship with surrounding architecture, etc. But a skateboarder might see it as obstacle. A tagger might see it as a surface. A late-night drinker might see it as a semi-private place to take a leak. And many might just see it as a thing that they don't even really think about, much less think about as art. 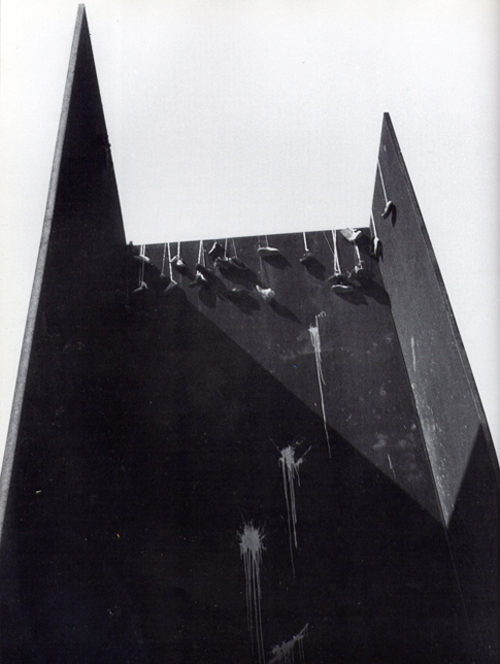 In 1981, David Hammons did a performance using TWU. He peed on it and then had an encounter with a police officer. (It is widely reported that he got arrested, but there is some doubt about that.) As it was, Serra's sculpture was already a home to graffiti, wheat-pasted signs and litter. Of course, 1981 was in the middle of a fairly grim period in New York's history. More recent photos show TWU as being graffiti-free. David Hammon undoubtedly had many things in mind when he did Pissed Off. But one of them must have been to reinact one of the grungy ways that the public interacts with public art. And this works really well with minimalist art like TWU because such pieces are empty vessels. They don't have accessible meanings for the general public. They aren't obviously memorials, for example (unless they have the names of the dead engraved on them, as in the Vietnam Veteran's Memorial by Maya Lin). They don't represent something, like a civic bronze statue. Instead, they are just objects plopped down in some park or square someplace. So Hammons, as an artist, treats TWU the same way many non-artists do. In one performance, it becomes a urinal. In another, a place for shoes. Interestingly, Hammon is not just dealing with public art, he is specifically reacting to a piece of minimalist art. Jim Nolan's work has also been largely about dealing with the legacy of minimalism and post-minimalism. Part of this involves creating work out of deliberately cheap materials--crap purchased off the shelf from 99¢ Only or Home Depot. So when he was commissioned to do a temporary public installation as part of the Blaffer Art Museum's Window Into Houston series, it must have seemed like an opportunity for him to play with the idea of minimalist art in public spaces in his usual way. But the thing here is that these windows in a building on Milam in Downtown Houston are not very big. He exactly can't do a "life size" piece the way David Hammons did in 1981. To address public art, he has to shift his scale. He also uses a small amount of model railroad landscaping material in the "scale model" portion of the piece. A hastily spray-painted green line is used to suggest a tree-line. But viewed on another scale (life-size), it also suggests graffiti. Nolan is mixing a scale model of a park filled with minimalist public art with life-sized things that one might find in such a park--unofficial and occasionally illegal interactions with the art. So he includes objects like beer bottles, fast food wrappers and an old flannel shirt, the kind of trash one might encounter around large scale public art pieces if you get there before the groundskeepers do. shifting SCALE is a work that loops in on itself. It is a piece of public art about public art. It is simultaneously life-size and a tiny scale model. It contains representations of its subject as well as actual found objects as its subject. And like TWU, shifting SCALE exists in public. That means that Nolan can't predict how the public will react--the people who see it will not necessarily be art appreciators. In fact, if it weren't for the sign that accompanies shifting SCALE, it's quite possible that some viewers would not realize that this is a piece of art at all. The piece could end up vandalized or the windows broken. A homeless person might sleep under one of the windows one night, or park himself there with a sign reading "Need Money For Food" in hopes of scrounging a few bucks off the drivers exiting I-10 for downtown. And a street critic (a variation on the street artist) may tag it with a succinct critique: "needs work". Nolan seems to have anticipated a range of types of engagement viewers might have, including apparent indifference. He knows he's asking a lot of the average joe viewer. Maybe that's why he includes bouquets as part of the piece--little peace offerings to the public. Amazing what you can buy at the 99¢ Only store. What next? I think HAA needs to commission a permanent piece of public art from Nolan. Now that Wayne Dolcefino is not on the air anymore, they might get away with it.